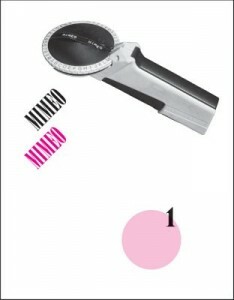 In this installment we hear from Kyle Schlesinger & Jed Birmingham about their magazine Mimeo Mimeo. Needless to say, it’s a favorite at the shop. Kyle Schlesinger: It is our hope that readers of Mimeo Mimeo will be newcomers to poetry, typography and artists’ books, as well as specialists in these fields. Theorists, practitioners and collectors in each of these domains might appreciate the grassroots nature of this independent magazine that has grown in scope and popularity since the beginning. Jed Birmingham: Anybody who really wants to use it. I want Mimeo Mimeo to be like a Velvet Underground album in the 1960s. Not many people bought one but everybody who did, made something of the experience. KS: I had the idea of editing a periodical that would somehow reflect the three primary genres that Cuneiform Press publishes: poetry, artists’ books and typography. Jed sent me a great essay about Jeff Nuttall’s My Own Mag, and was very interested in how the magazine was shaping up. In fact, he had so many ideas, so much boundless energy, that I thought it would be wise to invite him to co-edit, and I’m very happy he accepted the invitation. JB: Along with Mimeo Mimeo, I also co-edit RealityStudio.org, which is a website dedicated to William Burroughs. That site has a very strong focus on little magazines and the small press, because those are the Burroughs items I collect. Burroughs appeared in the last issue of Black Mountain Review, the “Beat” issue co-edited by Robert Creeley and Allen Ginsberg. I was preparing to write a short piece to support the cover images I had of the complete run of BMR and I came across Kyle’s article on Creeley’s Typography. I was absolutely blown away at his insights on printing and magazine design. I immediately wrote him what amounted to a fan letter and asked for copies of anything else he wrote. I provided him with links to RealityStudio. At the same time, I was working on an article on My Own Mag, which changed drastically and got much more sophisticated based on reading Kyle’s work and other articles he suggested. Kyle stated an interest in publishing that article and he outlined Mimeo Mimeo, which captured my attention because my collecting had moved away from just Burroughs and was focusing on publications of the Mimeo Revolution, not associated with Burroughs like Open Space, J, Set, TISH, and others. My images of and ideas on those publications did not quite fit on RealityStudio but were perfect for Mimeo Mimeo. KS: Journal of Artists’ Books(JAB), After Image and Fine Print are the three periodicals I had in mind when we started, and I was particularly interested in the fact that there was very little overlap between the three. I saw that there was a lot of value in publishing very specific articles within these disciplines while making a more radical editorial juxtaposition with the hope that each issue would make connections without becoming too vague. 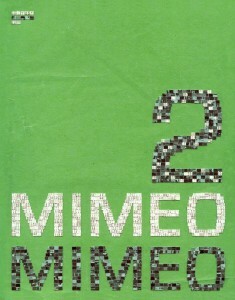 JB: I have always seen Mimeo Mimeo as an archive. I do not want it to be just straight essays. I like that there are letters, interviews, tons of images. I was very excited about Steve Clay’s piece on Creeley’s library with the photographs by Buzz Spector. I cannot wait for the Lewis Warsh (Mimeo Mimeo #7) issue to come out with all the bibliographical information and details. So with Creeley in mind, I get excited when not so much the look, but the content approaches that of Olson: The Journal of the Charles Olson Archive. KS: Not much different, actually. We’ve considered running it off on a real mimeograph, but that would just make it a fetish object (here used in the negative, but we often use the word in a positive sense). Mimeo magazines were all about getting the word out fast and cheap, which is why we originally embraced print-on-demand as the contemporary technological equivalent to get the job done cheap and fast. It’s a similar attitude. After putting out the first issue, with Jed’s article on My Own Mag, an interview I conducted with Alastair Johnston, and an essay by Christopher Harter, we began producing larger editions. JB: I think I am more seduced by that fetish object than Kyle. Maybe it is the collector in me. I really enjoyed Mimeo Mimeo #3, which was devoted entirely to an article by Daniel Snelson and came with a chapbook manifesto authored and printed by Aaron Cohick. I would like to see more inserts and maybe even a magazine within the magazine, like the Burroughs section in My Own Mag. I also think it would be great if we could let a book artist provide an insert or even design an issue. This is getting to sound a bit like Aspen, which I have a love/hate relationship with. That said, I would enjoy incorporating other printing techniques and formats. 5.) What is your favorite non-art, non-lit magazine? KS: National Geographic is always great, especially the photographic reproduction techniques in their pre-1961 issues. Phil Zimmerman was talking about this the other day. JB: It is funny that Kyle mentions National Geographic, because I subscribed to the magazine throughout my childhood. I rarely read it, but I spent hours and hours with the inserts, especially the maps. I remember taping together sheets and sheets of tracing paper and obsessively recreating maps of Roman trade routes in different color inks. There is a Zen feeling to the tracing and then to simultaneously have your mind flooded with information and fantasies stirred to life by that information. Maybe that is why I want more inserts in Mimeo Mimeo. During my childhood, I subscribed to tons of magazines a month. Highlights, Ranger Rick, Omni, Sports Illustrated, Sport, National Geographic, Baseball Digest, Basketball Weekly. Fortune, Time, Forbes, Newsweek all came in the mailbox. Hours about hours on a large chair surrounded by magazines. On the weekends, I read three or four newspapers cover to cover on the kitchen table. I am 40 and I just might be from the last generation that experienced print like this. I went through college without owning a computer. I was not born digital. Mimeo Mimeo comes out of these reading experiences. Find out more and purchase Mimeo Mimeo here, then listen to Threads (a series of talks curated by Steve Clay and Kyle Schlesinger devoted to the art of the book featuring poets, scholars, artists, and publishers).